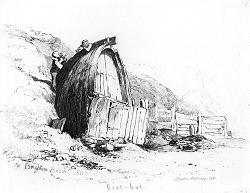 COOKE, Edward William, 1811-1880 : BOAT-HUT. ON BRIGHTON BEACH. London : 1830. A handsome antique print – a delicate etching of a hut made from a boat on Brighton beach. Originally produced for Cooke’s “Sixty Five Plates of Shipping and Craft” (London : 1829-1830). Etching on paper. Printed surface 117 x 159mm (approx. 4-5/8” x 6-1/4”). In very good and clean state. A guaranteed genuine antique print. COOKE, Edward William, 1811-1880 : ROPE HOUSES &C. ON THE BEACH AT BRIGHTON. London : 1830. 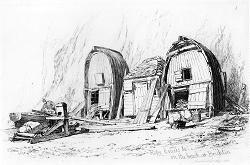 A handsome antique print – a delicate etching of huts on the beach at Brighton. Originally produced for Cooke’s “Sixty Five Plates of Shipping and Craft” (London : 1829-1830). Etching on paper. Printed surface 116 x 186mm (approx. 4-5/8” x 7-1/4”). Faint crease to blank corner, but in very good and clean state. A guaranteed genuine antique print. COOKE, William Bernard, 1778-1855 & COOKE, George, 1781-1834 : SHOREHAM CHURCH : SUSSEX. London : Vernor & Hood, 1801. A pleasant antique print – the fine towered parish church of St. Mary de Haura at New Shoreham. 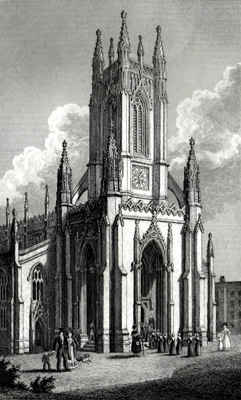 Drawn and engraved by William Bernard and George Cooke. Originally produced for the part-work “Beauties of England and Wales” (London : 1801-1816). Copper line engraving on paper. Later hand colour. Engraved surface 110 x 149mm (approx. 4-3/8” x 5-7/8”). In very good and clean state. A guaranteed genuine antique print. HINCHLIFF, John James, 1805-1862 : BRIGHTON. London : J. & F. Harwood, [ca.1840]. 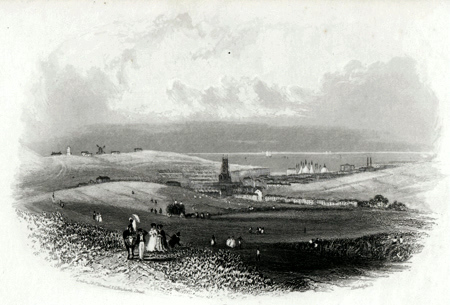 A rare and unusual antique print – an oval vignette view of Brighton from the hills above. The engraving decorates a double-leaf of ornamental notepaper. Engraved by John James Hinchliff and published by John & Frederick Harwood of Fenchurch Street, well known in their time for producing this kind of decorative stationery. For more on the Harwood family, see my Bookhunter on Safari blog-post for 29th October 2015. Steel line engraving on paper. Engraved surface 101 x 152mm (approx. 3-7/8” x 6”). A few tiny marks, but overall in very good and clean state. A guaranteed genuine antique print. 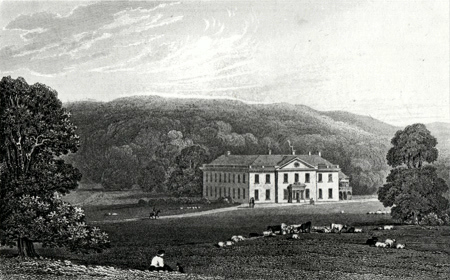 NEALE, John Preston, 1780-1847 : STANMER PARK, SUSSEX. [London : Jones & Co., 1831]. A pleasant antique print – a view of the eighteenth-century Stanmer House near Brighton. 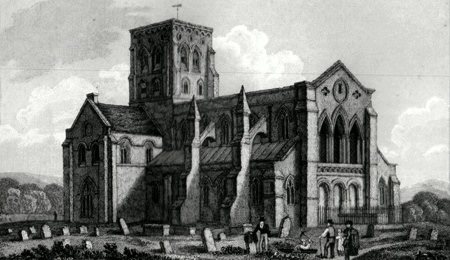 Engraved by John Charles Varrall (1794-1855) from an original study by John Preston Neale. Originally produced for the partwork series “Views of the Seats, Mansions, Castles, etc. of Noblemen and Gentlemen” (1829-1831). Steel line engraving on paper. Engraved surface 87 x 126mm (approx. 3-1/2” x 5”). A few tiny specks, but overall in very good and clean state. A guaranteed genuine antique print. NELSON & SONS, Thomas – publishers : THE AQUARIUM, BRIGHTON. [London] : T. Nelson & Sons, . An attractive antique print – the handsome Victorian gothic exterior on the front. Originally produced for the Nelson “English Scenery” series of views and view-books. Chromolithograph on paper. Printed surface 125 x 81mm (approx. 5” x 3-1/4”). In very good and clean state. A guaranteed genuine antique print. NIBBS, Richard Henry, 1816-1893 : BRIGHTON. Brighton : A. Hawkins, . 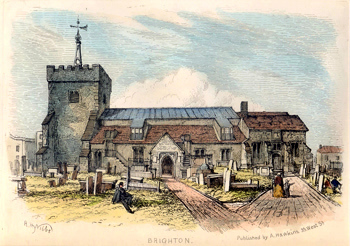 A handsome antique print of the old parish church and churchyard of St. Nicholas, Brighton. Originally produced for the “Sussex Churches” series produced in 1850-1851 by the Brighton artist Richard Henry Nibbs. Etching on paper. Later hand colour. Engraved surface 138 x 197mm (approx. 5-1/2” x 7-3/4”). In very good and clean state. A guaranteed genuine antique print. 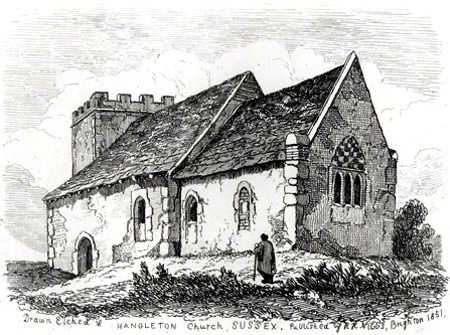 NIBBS, Richard Henry, 1816-1893 : HANGLETON CHURCH, SUSSEX. 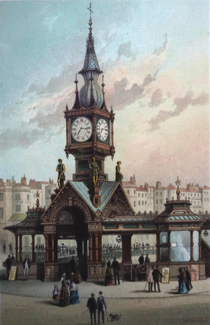 Brighton : R. H. Nibbs, 1851. An attractive antique print of the old parish church of St. Helen, Hangleton, north of Hove. Originally produced for the “Sussex Churches” series produced in 1850-1851 by the Brighton artist Richard Henry Nibbs. Etching on paper. Engraved surface 117 x 158mm (approx. 4-5/8” x 6-1/4”). A couple of tiny specks, but overall in very good and clean state. A guaranteed genuine antique print. NIBBS, Richard Henry, 1816-1893 : NEW SHOREHAM. Brighton : R. H. Nibbs, . 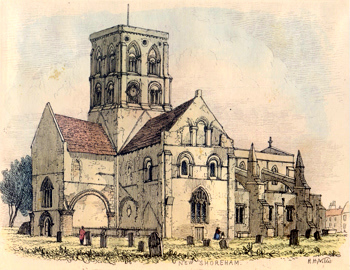 An attractive antique print of the fine old parish church of St. Mary de Haura, New Shoreham. Originally produced for the “Sussex Churches” series produced in 1850-1851 by the Brighton artist Richard Henry Nibbs. Etching on paper. Later hand colour. Engraved surface 120 x 160mm (approx. 4-3/4” x 6-1/4”). In very good and clean state. A guaranteed genuine antique print. 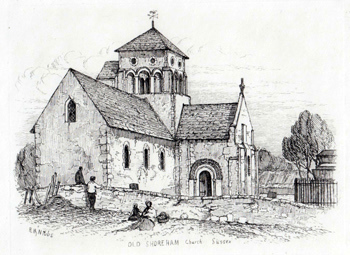 NIBBS, Richard Henry, 1816-1893 : OLD SHOREHAM CHURCH SUSSEX. Brighton : R. H. Nibbs, . 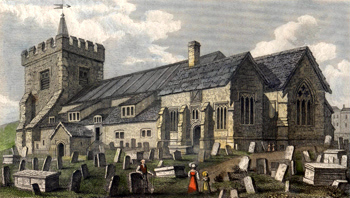 An attractive antique print of the Norman parish church of St. Nicholas, Old Shoreham, with figures in the foreground. Originally produced for the “Sussex Churches” series produced in 1850-1851 by the Brighton artist Richard Henry Nibbs. Etching on paper. Later hand colour. Engraved surface 116 x 156mm (approx. 4-5/8” x 6-1/8”). In very good and clean state. A guaranteed genuine antique print. Etching on paper. Engraved surface 116 x 156mm (approx. 4-5/8” x 6-1/8”). In very good and clean state. A guaranteed genuine antique print. 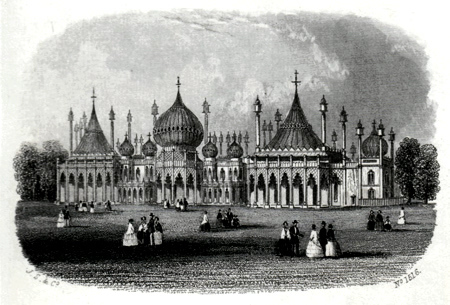 Brighton : R. H. Nibbs, 1850. 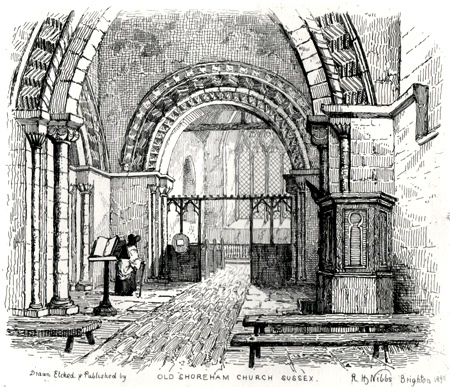 An attractive antique print of the interior of the Norman parish church of St. Nicholas, Old Shoreham. Originally produced for the “Sussex Churches” series produced in 1850-1851 by the Brighton artist Richard Henry Nibbs. Etching on paper. Engraved surface 144 x 168mm (approx. 5-5/8” x 6-5/8”). A few tiny specks, but overall in very good and clean state. A guaranteed genuine antique print. NIBBS, Richard Henry, 1816-1893 : PORTSLADE. [Brighton : W. J. Smith, 1872]. 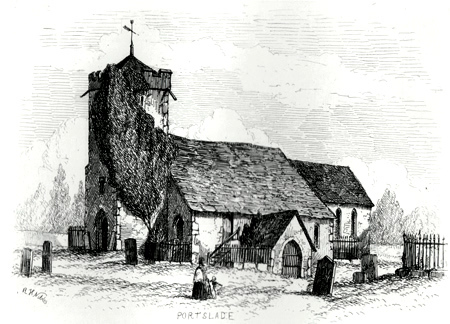 An attractive antique print of the old parish church of St. Nicolas at Portslade. Originally produced for the “Sussex Churches” series produced in 1850-1851 by the Brighton artist Richard Henry Nibbs and here in the later 1872 reissue. Etching on paper. Engraved surface 115 x 160mm (approx. 4-1/2” x 6-1/4”). A few tiny specks, but overall in very good and clean state. A guaranteed genuine antique print. NIBBS, Richard Henry, 1816-1893 : PRESTON. Brighton : R. H. Nibbs, . 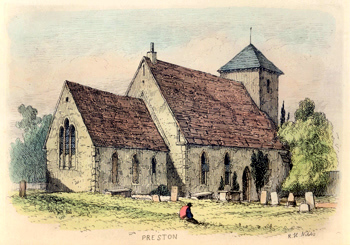 An attractive antique print of the old parish church of St. Peter, Preston, on the London Road. Originally produced for the “Sussex Churches” series produced in 1850-1851 by the Brighton artist Richard Henry Nibbs. Etching on paper. Later hand colour. Engraved surface 112 x 160mm (approx. 4-1/2” x 6-1/4”). In very good and clean state. A guaranteed genuine antique print. 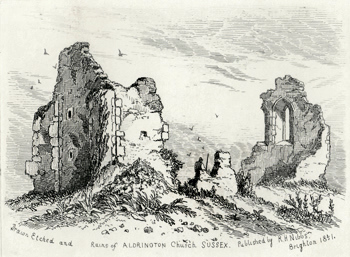 NIBBS, Richard Henry, 1816-1893 : RUINS OF ALDRINGTON CHURCH SUSSEX. Brighton : R.H.Nibbs, 1851. 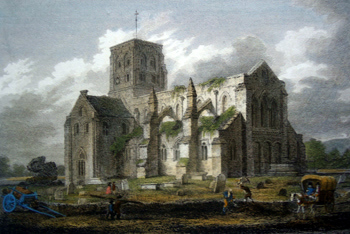 A pleasant antique print – the ruins of the mediaeval church of St. Leonard at Aldrington. Originally produced for the “Sussex Churches” series produced in 1850-1851 by the Brighton artist Richard Henry Nibbs. Etching on paper. Engraved surface 114 x 160mm (approx. 4-1/2” x 6-3/8”). In very good and clean state. A guaranteed genuine antique print. SHURY, John, 1789-1854 : THE PAVILION, BRIGHTON. [London : J.S. & Co., ca.1850]. A charming small antique print – a vignette view of the Brighton Pavilion. The engraving decorates a double-leaf of ornamental notepaper. Engraved by John Shury & Co. as part of an untitled numbered sequence in which this is number 1616. Steel line engraving on paper. Engraved surface 75 x 93mm (approx. 2-7/8” x 3-3/4”). Some faint browning to extreme edges, not affecting image; tiny stab-holes to fold, but overall in very good and clean state. A guaranteed genuine antique print. WHITTOCK, Nathaniel, 1791-1860 : PORTLAND PLACE, BRIGHTON. London : I. T. Hinton, 1829. 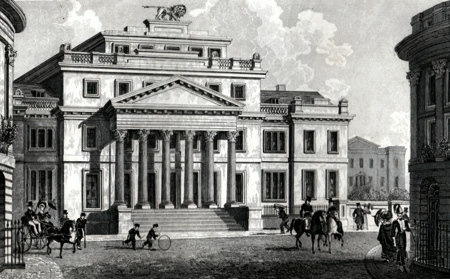 A handsome antique print – the elegant Portland House, designed by Charles Busby for Major Villeroy Russell and which used to stand at the top of Portland Place. Engraved by Richard Winkles (fl.1829-1831) from an original study by Nathaniel Whittock. Originally produced for the partwork series “Picturesque Beauties of the Counties of Surrey & Sussex” (London : 1829-1831). Steel line engraving on paper. Engraved surface 102 x 153mm (approx. 4” x 6”). A few tiny specks to outer blank margins, but overall in very good and clean state. A guaranteed genuine antique print. WHITTOCK, Nathaniel, 1791-1860 : ST. NICHOLAS’S CHURCH BRIGHTON. London : Edward Lacey, . An elegant antique print of the old parish church, engraved by John Rogers (1800?-1882) from an original study by Nathaniel Whittock. Originally produced for the partwork series “Picturesque Beauties of the Counties of Surrey & Sussex” (London : 1829-1830). Line engraving on paper. Later hand colour. Engraved surface 99 x 156mm (approx. 3-7/8” x 6-1/8”). One small mark in lower margin, but otherwise in very good and clean state. A guaranteed genuine antique print. WHITTOCK, Nathaniel, 1791-1860 : ST. PETERS CHURCH, BRIGHTON. London : I. T. Hinton, 1829. An elegant antrique print – Charles Barry’s Gothic Revival church at Brighton, built between 1824 and 1828. Engraved by John Rogers (1800?-1882) from an original study by Nathaniel Whittock. Originally produced for the partwork series “Picturesque Beauties of the Counties of Surrey & Sussex” (London : 1829-1831). Line engraving on paper. Engraved surface 158 x 93mm (approx. 6-1/4” x 3-5/8”). A few tiny specks to outer blank margins, but overall in very good and clean state. A guaranteed genuine antique print. WHITTOCK, Nathaniel, 1791-1860 : SHOREHAM CHURCH. London : I. T. Hinton, 1829. 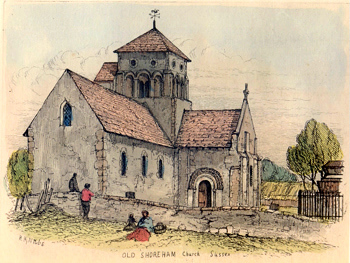 An attractive antique print of the fine old parish church of St. Mary de Haura, New Shoreham. Engraved by John Rogers (1800?-1882) from an original study by Nathaniel Whittock. Originally produced for the partwork series “Picturesque Beauties of the Counties of Surrey & Sussex” (London : 1829-1831). Line engraving on paper. Engraved surface 100 x 157mm (approx. 4” x 6-1/8”). A few tiny specks to outer blank margins, but overall in very good and clean state. A guaranteed genuine antique print. Return to Antique Prints index page. Return to Sussex index page.